Furture Pay 5% Cashback on Loading Money + 10% Cashback on Speeding Use Future Pay for a cashless, hassle-free experience while shopping. Get 5% cashback on loading money to Furture Pay app and 10% cashback on spending Rs. 1000 or above at Future Group stores such as Big Bazaar, Ezone and Home Town. Maximum cashback is Rs. 200. Load money and Get 5% cashback on Rs 100 & above. Transact and Get 10% cashback on Rs.1000 & above. Valid in big bazaar, hometown & ezone only. Download Future Pay App . Load money to Get 5% cashback on Rs 100 & above. Transact and Get 10% cashback on Rs.1000 & above (Maximum cashback Rs.200). You can link your loyalty cards with Future Pay and earn and burn loyalty points without carrying any cards. How does Future Pay work ? Future Pay is just like ready to use cash. All you have to do is register & start using it. Simply add some money, or link your loyalty cards and get going. 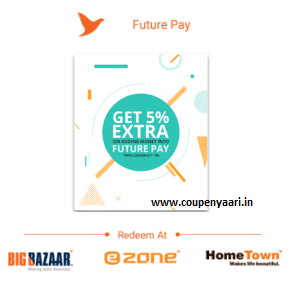 You can now use Future Pay at all Big Bazaar, Ezone and Home Town stores.